Just in time for Halloween, Barry Diller has raised Pier 55 from the dead. 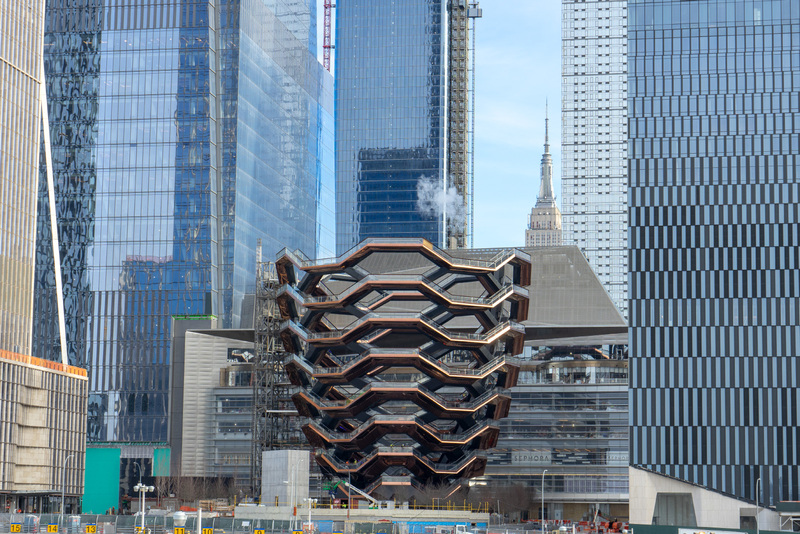 Today Diller, the financier and chair of media conglomerate IAC, issued a statement today on the project, a Thomas Heatherwick–designed pier and performing arts center in the Hudson River he was funding up until last month. Diller pulled out of the $250 million just 43 days ago, after opponents, mainly the City Club of New York, challenged the project repeatedly in court. The parties were negotiating a settlement that would allow the project to move forward just prior to Diller's pull-out. Now, none other than Governor Andrew Cuomo has stepped in to facilitate a preliminary agreement between Diller and the City Club, which agreed to abandon their fight in the courts. "Although I and many others aren't very fond of the design of Pier 55, allowing [the pier] is a tradeoff," Michael Gruen, president of the City Club, told The Architect's Newspaper (AN). With the latest agreement, though, "we think we've won more than we lost." According to Gruen, the deal assures that key parts of the park, like underutilized piers, will be rebuilt, and the governor has promised state money for these projects. The Hudson River estuary will also be protected. The agreement, however, has not yet been formally drafted and signed by the stakeholders, which include pier stewards the Hudson River Park Trust. "We have had productive conversations and it has been agreed that the legal dispute commenced by the City Club will cease," said Cuomo, in a statement. "Pier 55 will go forward, and we will work cooperatively to complete the full vision for the Park." Terreform is a nonprofit center for urban research and advocacy, founded in 2005. We’ve long taken an interest in the fate of Pier 40 (our studio is a few blocks away) and the development of the Hudson River waterfront. We were involved in doing analysis and design in response to the recent air rights transfer across West Street and the funding it brought for vital repairs to the pier. We’d previously offered a proposal for relocation of a portion of the NYU expansion to the site. We’ve been closely observing the ongoing contretemps over Barry Diller’s proposal to build a new entertainment pier on the site of the largely vanished Pier 55 at a project cost of $250 million. While we greatly admire the work of Thomas Heatherwick (the scheme’s imaginative designer), have no issue with generous philanthropy, and ardently wish to see the Hudson River Park become ever more splendid and capacious, we do wonder at the logic of this particular investment in the context of a public space obliged to financially fend for itself and monumentally strapped. More specifically, we wonder whether this enormous investment—and the program it will support—might be directed to a place where it is far more urgently needed and appropriately housed: Pier 40. Pier 40 has represented a frustrating combination of problem and opportunity for years, somehow stymying all efforts to realize its full public potential. At present, it provides invaluable and beloved sports fields to the community but its primary “service” is as a huge parking lot. This may be a cash cow for the Hudson River Park Trust but it’s surely the least appropriate possible use for such a vast and charismatically-sited facility. Likewise, most of the proposals that have been floated for Pier 40’s renewal over the years have been over-focused on two private styles of reconstruction, on luxury housing or office space, rather than on realizing its truly remarkable potential as a scene of pleasure and recreation. Our idea is simple: invest the $250 million earmarked for Pier 55 in Pier 40. Build facilities—theaters and a park—of exactly the same size and capacity as planned for the uptown site. Then add as much additional fabulousness as possible. 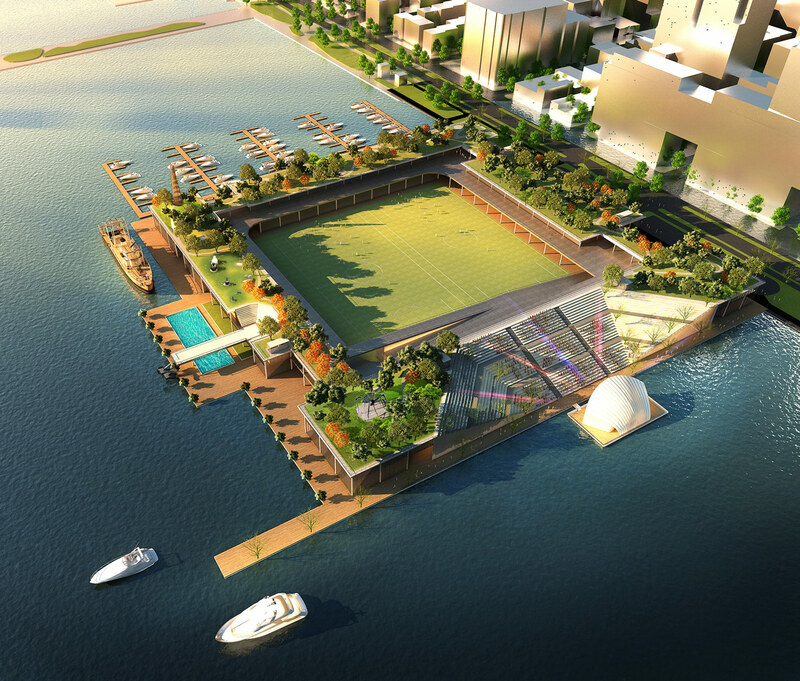 The attached sketches show expanded recreational and sports facilities (including indoor tennis courts and gyms and a pool), more theaters and performance spaces (featuring a large amphitheater with a floating stage that might migrate around the city), a vast forested rooftop and sculpture garden, a marina, a complex of waterside restaurants, a school, community offices, a small hotel, ample opportunities for strolling and sitting along the water, and dock space for a variety of ships and boats. The whole might not generate quite the revenue as parked cars but the stream could be ample and the initial subvention would take care of the expense of construction. Thomas Heatherwick would be great choice for architect! We look forward to the handshake between Barry Diller, Douglas Durst, Bill de Blasio, and Andrew Cuomo that seals this win-win deal! The Appellate Division of the State Supreme Court decided Monday to waive a temporary injunction against Pier55, a new 2.7-acre park along/in the Hudson River, to allow construction to continue at least until September when the full case is heard before the court. Pier55 is designed by Heatherwick Studio. Diane von Furstenberg and Barry Diller are major funders of the $130 million project. Construction on Pier55 began in late June. Although the project has been approved by the New York State Department of Environmental Conservation, the U.S. Army Corps of Engineers, and the local community board, the City Club of New York has sued to block the project. Workers may now continue pile-driving for the balcony that will sit over the river. A spokesperson for Pier55 today released this statement in response to the Court’s decision: “With the City Club’s latest charade behind us, we will get back to building the new public park that local residents have sought for years. Now that both state and federal courts have denied its demand for an injunction, the City Club should take this cue to finally end its absurd crusade against the wishes of the community. We remain committed to making Pier55 a reality and providing new green space for all New Yorkers to enjoy.” Both the Pier55 development team and the City Club have aired their grievances on The Architect's Newspaper's op-ed page. Read their letters here, and here. 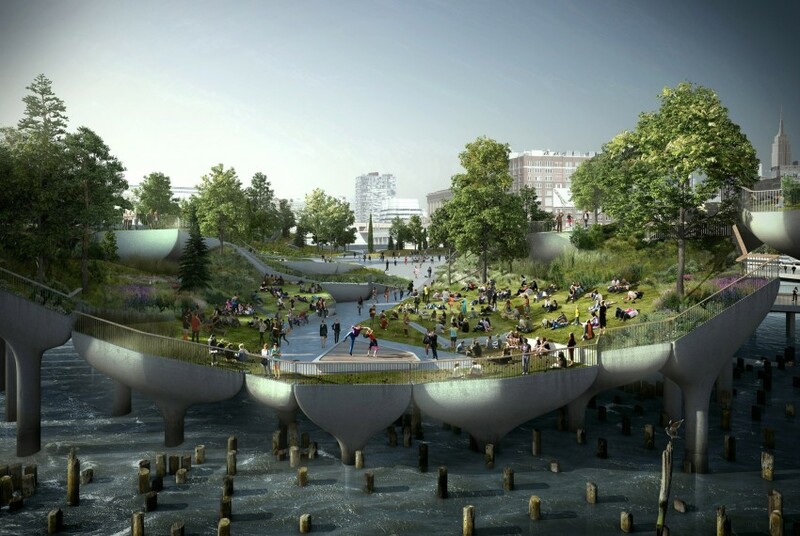 In April this year, British architect Thomas Heatherwick's Pier55 project was given the go-ahead from the New York State Supreme Court. Back then, all looked good for the $130 million, 2.7 acre island of public space located off of the lower west side of Manhattan. Now, construction is to be delayed after the court has allowed opponents of the project more time for their case to be prepared. The result of an injunction issued by the New York State Appellate Division, the Hudson River scheme is likely to restart construction by September at the earliest. Notable opponents to Pier55—which is backed by Barry Diller and Diane von Furstenberg—include the City Club of New York, who penned a letter published by AN in opposition of the project, activist Tom Fox, and environmentalist Rob Buchanan. "The project would require driving about 550 piles in an area of the Hudson protected as an estuarine sanctuary,” the City Club wrote in an AN op-ed published this January. “Diller and von Furstenberg would receive a 30-year lease to operate the island as a performing arts venue and naming rights to the island in perpetuity.” “The project has also been through a rigorous and transparent environmental review process and the New York State Department of Environmental Conservation has already determined that an Environmental Impact Statement is not required,” said the Pier55 development team in reply. “It must also be noted that Pier55’s 2.7-acre size is within the scope of what is allowed based on a 2013 law amending the state’s Hudson River Park Act. 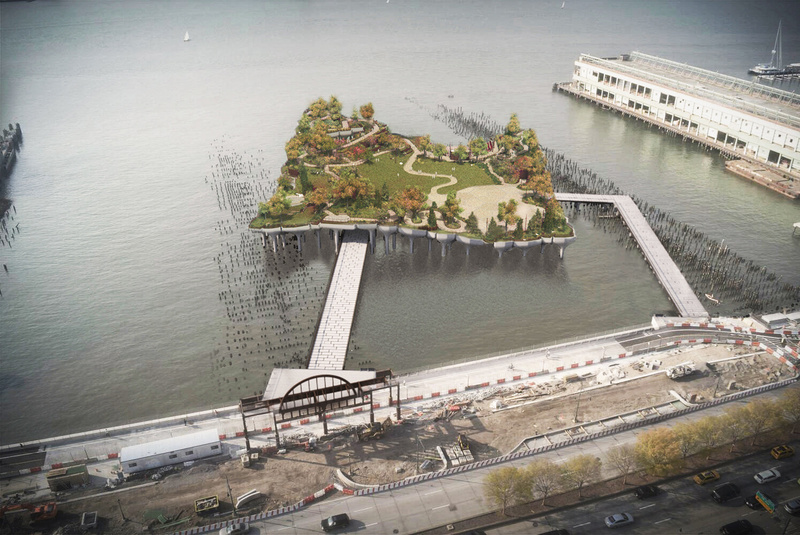 This amendment, crafted based on input from the local community board and other stakeholders, allowed HRPT to rebuild the former pier outside its original footprint.” In April, as mentioned earlier, Manhattan Supreme Court Judge Joan Lobis ruled that The City Club's claims to be "without merit". "It would appear that a significant purpose of maintaining event spaces in the Park is to generate funds for the ongoing upkeep of the Park, which is surely a park purpose," said Lobis. In light of the recent injunction, City Club President Michael Gruen issued a statement said the move was a "valuable step in ensuring that this secretive and misguided project will not get off the ground."